Join us for a unique experience on the Elm Fork of the Trinity river, paddling through the eco system of the old and the new river channel at LLELA. $50 per paddler and includes refreshments, (registration required) join us for a unique experience on the Elm Fork of the Trinity river, paddling through the eco system of the old and the new river channel at LLELA. We shuttle you back to LLELA after the kayaking and your welcome to hike around and enjoy your time at LLELA too. To Help preserve and protect the natural resources of this area, were making a water trail to be accessible to all paddle skill levels of the general public. Were also helping educate the public through environmental awarenes while ejoying the outdoor experience of the park and the Trinity River. When: The third Saturday of the each month at 10:00am at LLELA. 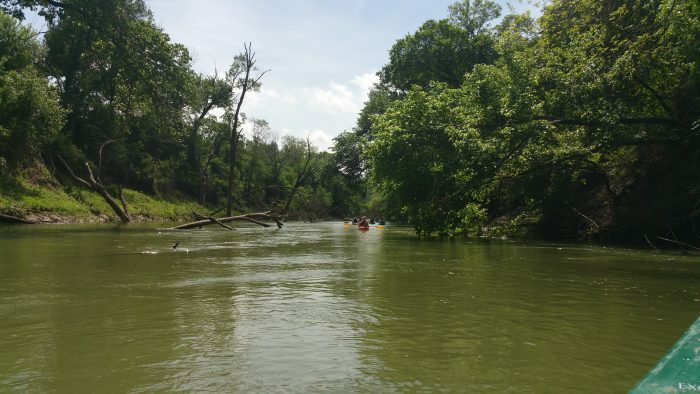 Volunteer to clean up at LLELA or join us for the eco river tour safety talk between 9&10, then paddles wet at 10:00 am, for a 2 to 3 hour trip down the river and through one of the most pristine section of the Trinity in Dallas! Where: The Lewisville Lake Environmental Learning Area, see the maps at the right or download the directions to LLELA. Please remember this is an outdoor event, please dress with that in mind, outdoor activity and water based fun! Why: Because it’s fun, because it a part of the larger DFW area that been re-opened to the public and you can be one of the first to help return it to a more pristine state, including cool water, and a clean environment! The Elm Fork Trinity river trip. This paddle trip starts from LLELA and follows the river to Hebron Parkway. The put in at LLELA is an easy launch into the outflow channel from the dam of Lake Lewisville.The take out requires kayaking skills and can be hazardous to the novice kayaker. Average time for this trip is 2 to 3 hours including a shuttle with the gear back to LLELA. This trip can vary in time based on several factors including water flow. This is a water based outdoor activity, please dress accordingly and plan for being in and around water and outside in the sun.